Tiny coccinellid beetles that devour many types of scale. They are valuable for being able to chew through hard scale as well as eat eggs and immatures of hard and soft scale. 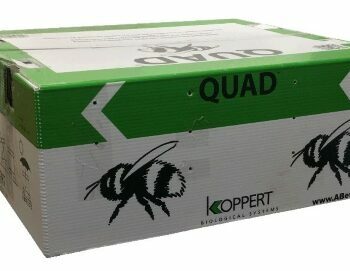 They are used in orchards, landscapes, Christmas tree farms, greenhouses and interiors. With ample food, light and moisture Rhyzobius beetles begin reproducing immediately. • Release as soon as possible. Until then, keep cool and ideally in a dark place to slow their metabolism. • Do not store in household refrigerator. They are susceptible to freezing. • Beetles are best released in high-density patches of reproducing scale that can become “Rhyzobius field insectaries”. Their offspring will spread out from those first sites searching for more patches of scale. • Releases outdoors are best made late evening. • Ant interference to biological control is a factor, but Rhyzobius can sustain their populations on the ant infested trees attacking the scale on the trunks and gray wood branches where ant trails foster high populations of scale insects. • Honeydew on leaves hinders movement of adults and larvae. Spray leaves with water to remove honeydew before releasing beetles. • This ladybug beetle is black with an orange colored head and thorax. Adults are larger than Stethorus spidermite destroyers, but smaller than aphid-eating Scymnus and much smaller than Cryptolaemus mealybug destroyers. • The forewings, elytra, are metallic black and clothed with grayish or light brown hairs. Prothorax is brown with a faint darker horizontal band across the middle. The ventral surface and legs are brown. • These ladybugs generally live up to a year laying 60 to 100 eggs when they find hot spots of reproducing scale insects. 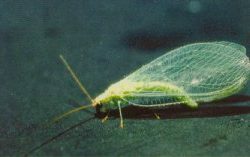 Production of scale crawlers stimulates egg laying. One or two eggs are found beneath the scale. They are oval, white and with a metal iridescence. They are attracted to hot spots if scale where they deposit eggs before resuming search for scale. They will lay eggs in mealybug masses, but that is not a preferred host. The warmer the weather, the more reproductive. • Larvae consume the scale under which they were deposited and then move on to attack many more scale until reaching maturity. They eat out an irregular hole in the scale covering. The mature larva is 4 mm long,dark gray with a lighter rectangular area on the dorsal line of the first four abdominal segments. There is also a strip of similar color on either side of the dorsal line on the thorax, and two narrower strips more laterally on the last four abdominal segments. • Beetles have been observed active at temperatures as low as 40°F and as high as 100o F.
• Works well with other beneficial insects including Aphytis. • Suggested release rates are 2-6 beetles/m2 (10 ft2) or 2-5 beetles/infested plant, weekly or biweekly, or 10-40 adults per tree depending on how fast you want to achieve control. 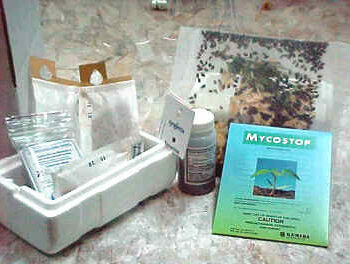 • Adult beetles released at 10 adults per infested tree form a colony for inoculation purposes. from the Insectary by Next Day Air ONLY! Can NOT be sent by US Mail! This item MUST be sent by Next Day Air. If you select a lesser shipping method, we will upgrade it to the minimum level and your shipping charges will be adjusted.